Image courtesy of MAROMAS Londres. The UNFASHIONED Museum is a day of immersive presentations, workshops, participatory talks and music that celebrates the rising influence of hip-hop, feminist and LGBTQI communities on contemporary culture. Co-curated by a group of talented students, designers, artists, bloggers and speakers whose work challenges the fashion industry’s conservative tastes and ideologies, the UNFASHIONED Museum encourages discussion, exchange and engages the sonic and visual realms to reaffirm black and POC innovators. 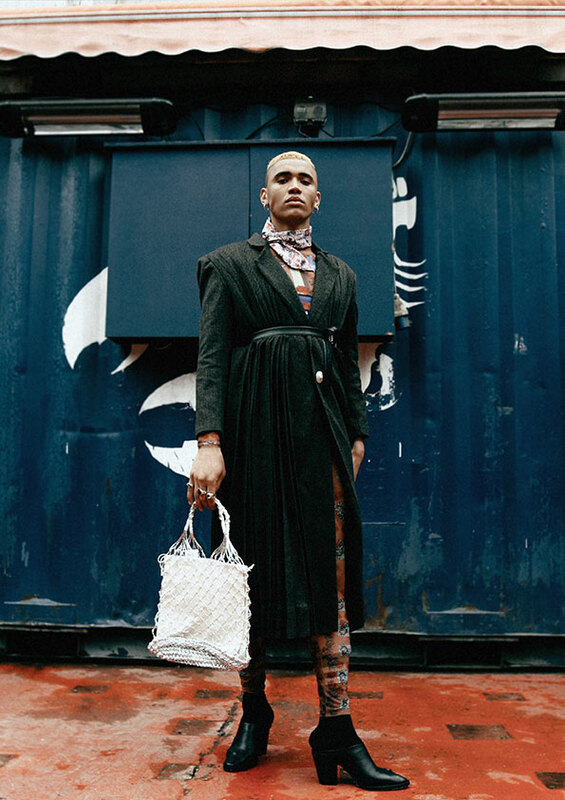 An immersive fashion presentation by London College of Fashion graduates Thomas Harvey and Mauro Pitteri, whose brand MAROMAS features idiosyncratic couture and silhouettes drawn from their exploration of black masculinities and the English Romantics. GUAP Talk: Is diversity in fashion just the latest trend? Participate in a discussion about inclusion in the fashion industry with designer and creative director, Aji Ayorinde; founder of @blackgirlsinfashion, Debora Tonet; and freelance writer, public speaker and plus-size fashion blogger Stephanie Yeboah. Hosted by Lola Michelle. GUAP Talk: Can you choose your identity or is it chosen for you? Freelance stylist and head stylist at GUAP, Seyon Amosu speaks with founder and designer of trans-positive fashion label Baal, Jenna Hartmann; and artist and poet Ashton Attzs. Hosted by Lola Michelle. Spoken word performance by poet Kai-Isaiah Jamal. This discussion delves into the relationship between club cultures, inclusion and dissent to think together about how to rupture binaries and whiteness. Discussants are Co-Founder of Resis’dance, Goldsnap and Project Director of Faggamuffin Bloc Party, Hackney Carnival’s first QTIPOC stage, Virginia Wilson; LCF Menswear graduates and MAROMAS designers Thomas Harvey and Mauro Pitteri; and Lizzie Masterton and Anjali Prashar-Savoie of Sonic Gaze, a project to reclaim the sonic through listening, making and desiring. DJ set by Resis’dance, a collective committed to representing women and non-binary people of colour in line-ups, club nights and festivals. The UNFASHIONED Museum is a collaboration between the London College of Fashion, Sonic Gaze, GUAP Magazine and the ICA. GUAP Magazine is the world’s first video magazine – a revolutionary youth platform at the forefront of creative culture, discovering and showcasing emerging talent. GUAP aims to document and nurture grassroots creative talent within music, fashion, the arts and business, both locally and globally. Insights is an online magazine produced by the Outreach team at UAL. Passionate about inspiring the next generation of artists, designers and creatives to make a mark on the world, the magazine features articles on art, design, media and communication, fashion and performing arts. Part of the University of the Arts London, London College of Fashion has nurtured creative talent for over a century. LCF believes in using the subject of fashion, together with its industrial importance, to shape lives and drive economic and social transformation. Course offerings range from business to design and fashion curation, with over 60 undergraduate and postgraduate degrees and 165 short courses. The Social Creative Network is a digital project connecting young people with the Institute of Contemporary Arts. SCN is curated exclusively by and for young people and is designed to create an enabling network for those who believe in the power of the arts and creative industries to make positive change in the world. Sonic Gaze is a project by Lizzie Masterton and Anjali Prashar-Savoie that explores power dynamics and sound. Sonic Gaze is committed to amplifying underrepresented voices and honouring lived experience, facilitating discussion, celebration and collaboration through events, workshops and zines. Resis’dance is a radical DJ and events collective that hosts fundraisers for grassroots groups; facilitates workshops about safer spaces; and offers DJ workshops for women and non-binary people.